Creamy, buttery smooth & indulgent gingerbread peanut butter with the perfect balance of warming ginger, woody cinnamon, dark molasses & rich, deep coconut sugar. I brought you my healthy Gingerbread Waffles a few weeks ago and the festive ginger theme continues today with this creamy, buttery smooth and indulgent Gingerbread Peanut Butter. 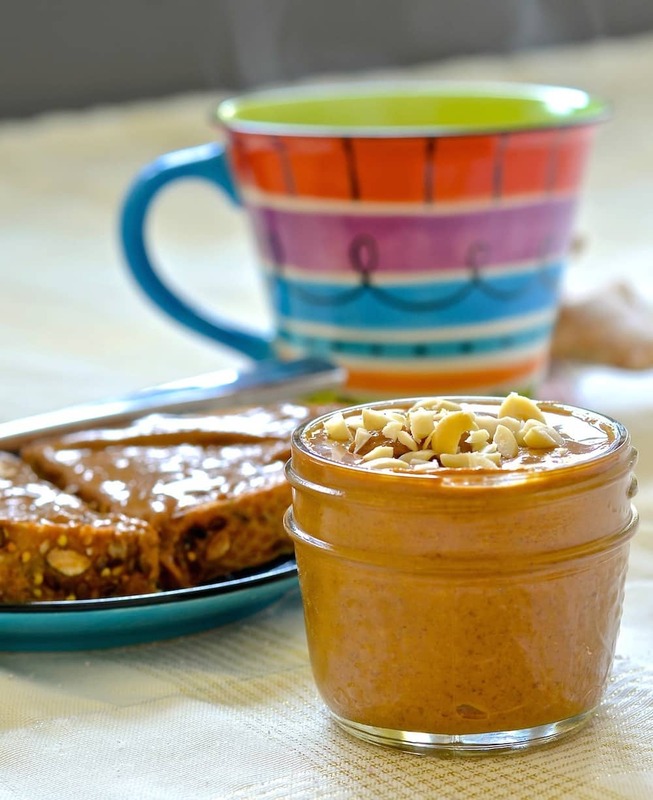 Peanut butter is a great source of protein, dietary fibre, vitamins, minerals and healthy fats. Although it isn’t a complete protein by itself, combine it with wholewheat bread as a meal or snack and all the essential amino acids are provided, making it complete. The perfect vegan snack! Homemade peanut butter is so easy to make yourself and is so much better than the ready made versions you get at the grocery store. Something magical happens to those peanuts when they hit the blades of a food processor. They become drippy, melty and buttery with no effort from you at all. It makes nut butters effortlessly. Peanut Butter is wonderful as it is and I make it regularly like that, but add some ginger, cinnamon, molasses and a touch of coconut sugar and you have yourself an extra special Gingerbread Peanut Butter. It tastes like gingerbread cookies in butter form. It is amazing on freshly baked wholewheat bread, spread on toast, added to oatmeal, in a banana smoothie or just eaten straight from the jar! It would also be awesome if used to make baked goods like cookies. This Gingerbread Peanut Butter would make a lovely gift for friends or family this Christmas. Decant into a clean mason jar, tie some twine or ribbon around the top with a cute tag and you’re good to go. People love to know that you put thought into their gift and spent your time making them something special and I promise you they will not be able to resist this Gingerbread Peanut Butter! Spread the peanuts evenly over the tray and roast for 20 minutes. Remove from the oven and allow to cool. They don't take long. Add the peanuts to a food processor. I have a 12 cup Cuisinart Food Processor and processed all of mine at once. If your food processor is smaller or you think it might struggle then do it in 2 lots. Process your peanuts. They will turn crumby at first, then thick and sludgy. If you keep at it though it will become melty, runny and buttery. It takes about 10 - 15 minutes tops. If your food processor starts struggling a bit or feeling a bit warm, just turn it off and leave it to rest for 5-10 minutes then start again. I've even had to go out halfway through before and left it and came back to it a few hours later. It was fine. Once you have reached the melty, glossy, runny stage you can add the molasses, salt, cinnamon, sugar and ginger. Process again until well combined. Spoon into clean jars and store in the fridge. It will keep for a month or so if you are disciplined enough not to eat it all within a few days! I prefer to buy raw peanuts and roast them myself as most ready roasted nuts are cooked in canola oil which I try to avoid. If you don't mind that then you can use ready roasted unsalted nuts for this recipe. Add the ginger and coconut sugar to taste. The strength of ground ginger can change depending on how old it is, how long it has been open etc. Add it gradually one teaspoon at a time, processing for a bit in between each addition and tasting as you go. That way you will get it just right for your taste. I like mine quite strong so added 5 teaspoons. Same goes with the sugar. I added 4 tablespoons but you might find you prefer it with less sugar. I tried this today and incorporated it into a Banana-Stuffed Baked French Toast recipe. While we enjoyed the flavors, mine came out very thick and I ended up combining it with some peanut butter from my pantry to achieve the right consistency. What I suspect happened is that I chose to grind my peanut butter at the store, rather than use the food processor, and didn’t know what quantity of peanut butter I should use. I made a guess and suspect I had less than necessary, resulting in the dry ingredients have too great an effect on the consistency. With that in mind, if we choose to use peanut butter already ground, what is the approximate quantity? It’s not something I have ever done. 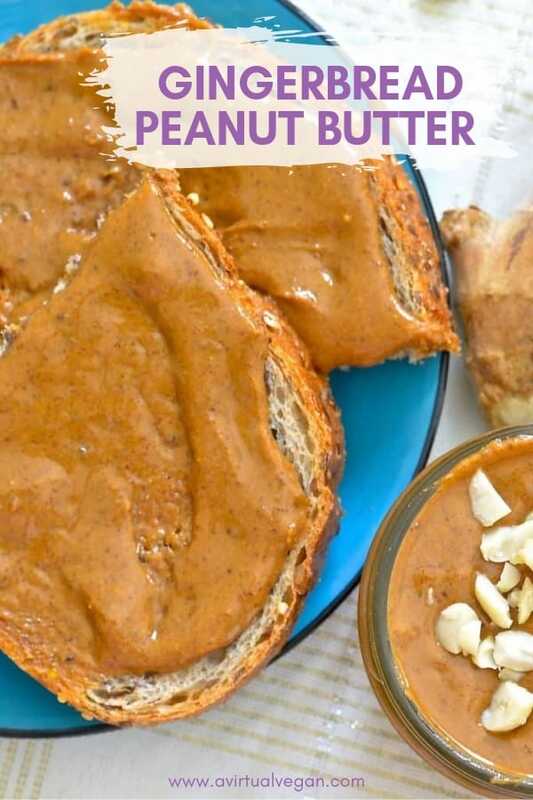 The whole recipe makes a little over 1.25 cups of peanut butter though, so you’d probably need a little less than that if you are using ready made peanut butter. I’ve never used one of those store grinding machines so I have no idea how drippy the peanut butter comes out. When you make it yourself it’s possible to control how drippy it gets. The more you process the more oil is released and the more liquidy it becomes. It should be drippy and liquidy and the dry ingredients shouldn’t make it thicker because it’s only a little bit of spice and the sugar dissolves in it. Maybe you didn’t process it long enough. 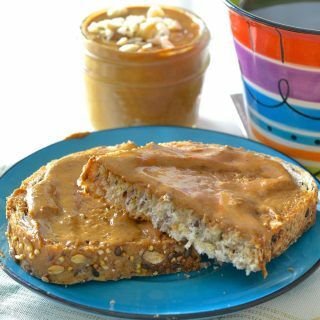 OMG I love making my own nut butters and I love this idea for Christmastime! I actually gave jars of nut butters to some people as gifts last year so this one might be one that I make this year. 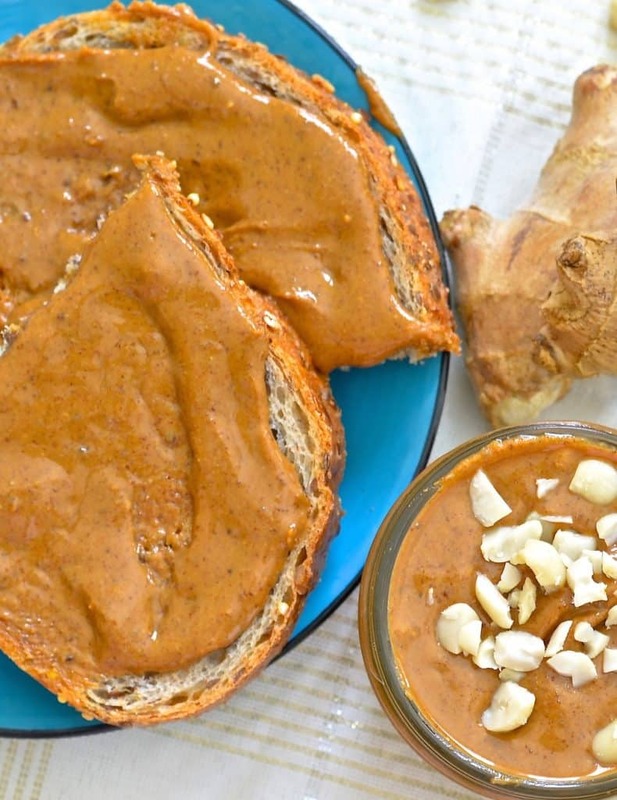 You can’t beat homemade nut butter. Giving it as gifts is a lovely idea and this one would be great because it tastes so festive! Hope you enjoy it! this is pretty awesome! I used my vitamix to prepare it and instead of trying to get it all off of the blades—- I added a chilled banana and some cold water and blended it up for a drink ! So glad you enjoyed it Yvonne and I love your idea for ‘cleaning’ the blender. I need to remember to do that next time I make nut butter.